When Calls the Heart is a Canadian-American television series based on prolific author Janette Oke’s 1983 novel of the same name. Like much of Oke’s work, this series is an example of “inspirational fiction” , which features upbeat stories imbued with religion-inspired messages and moral lessons suitable for families. The series was developed by Michael Landon Jr and has been a hit with audiences over the past five years. The setting for the series is a small western Canadian coal-mining town, Coal Valley, in Alberta in 1910. The narrative threads revolve around a young woman from a wealthy family, Elizabeth Thatcher, who arrives in the town from the more cosmopolitan eastern Canada (Hamilton, Ontario) to serve as the town’s only schoolteacher. Many of the themes of the series concern the cultural contrast between Elizabeth’s more culturally-refined background and the provincial circumstances with which she has to adjust. In this sense the viewer might be reminded of another famous television series, Northern Exposure (1990-95), which featured a similar cultural clash. However, I would say that When Calls the Heart does not measure up to Northern Exposure’s wit and insight. A distinctive feature of this series is the narrative focalization on the women characters. Most things that take place in these stories are seen from their perspective. And indeed women are the primary agents of changes that prevent negative consequences and lead to positive outcomes in the stories. Also “eye-catching” for me was the high percentage of performers with blue, or blue-green, eyes. While the percentage of blue-eyed Euro-Canadians was undoubtedly much higher in1910 than it is today, it is still amazing to me how many blue-eyed people you see in this series. Another positive series feature is the atmospheric cinematography of Michael Balfry and Robert Brinkmann, which supports the emotional tone being conveyed. However, the acting in the series is uneven, at best, and this is probably primarily due to the simplistically formulaic construction of many of the characters. 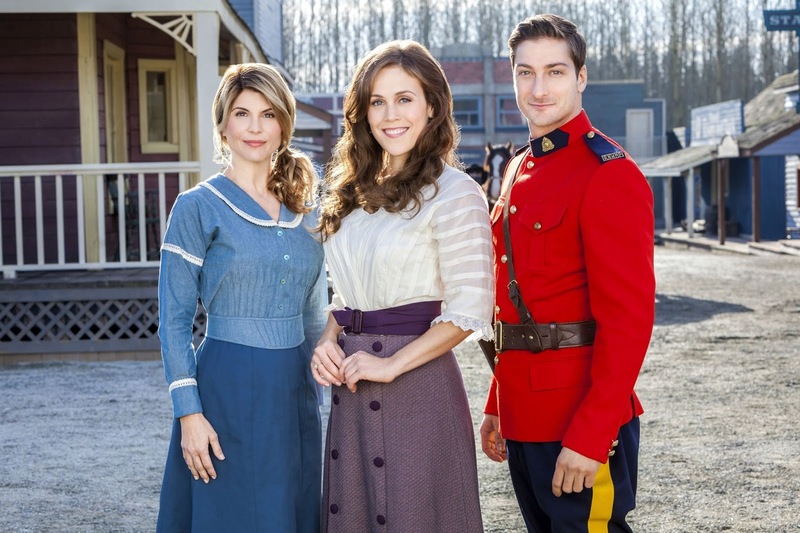 Nevertheless, lead performers Erin Krakow (in the role of Elizabeth Thatcher) and Daniel Lissing (playing Jack Thornton) often manage to rise above the trite nature of their scripted interactions by means of their subtly emotive facial expressions. In fact Ms. Krakow’s soulful countenance offers a crucial underlying current of feeling throughout the series. Elizabeth Thatcher arrives in Coal Valley to serve as the town’s schoolteacher in the aftermath of a tragic coal-mine explosion which killed 46 of the miners a couple of months earlier. The whole town is still in a state of shock and mourning, and Elizabeth becomes acquainted with a number of newly-widowed mothers who are now even more concerned about their children’s educations. 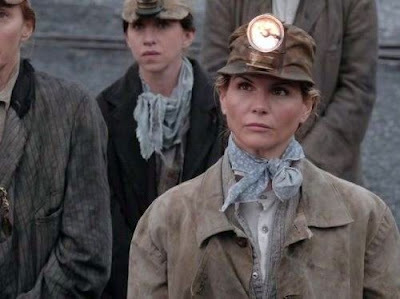 Notable among these widows is Abigail Stanton (Lori Loughlin), who lost her husband, who was the mine’s foreman, and her son in the disaster. 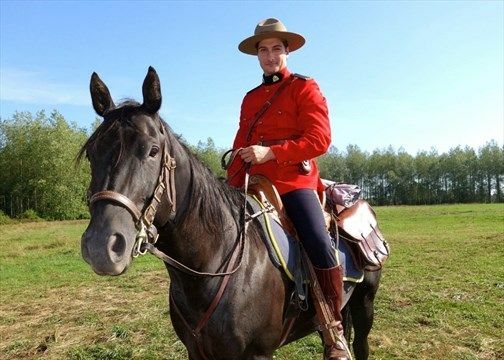 Elizabeth also meets Royal North-West Mounted Police Constable Jack Thornton (Daniel Lissing), who has been newly assigned to look after the town’s region. Although Elizabeth and the handsome and soft-spoken Jack seem like a natural pairing, things get off to a bad start between the two. Jack initially resentfully dismisses the young woman as a spoiled rich girl whose wealthy father may have stunted his career ambitions by having him assigned to this backwood’s spot in order to see that his daughter is protected. Another key figure is Henry Gowen (Martin Cummins), who is the owner of the coal mine and who basically bosses the company town. Gowen is a cynical, hard-hearted opportunist who seeks to exploit every situation he encounters. Henry Gowen embodies self-centered exploitation and heartless cruelty. Abigail embodies a positive and Christian-inspired attitude of inclusive kindness and you-can-do-it optimism about the world. In a number of cases, there is a Gowen-backed obstacle placed before the Coal Valley community, in response to which Abigail lights a faith-inspired pathway to overcome that obstacle and find harmonious contentment. At the end of Season 1, these Gowen-Abigail confrontations come to a head in the form of a prospective court case concerning who may be held responsible for the coal-mine disaster that killed 46 people. 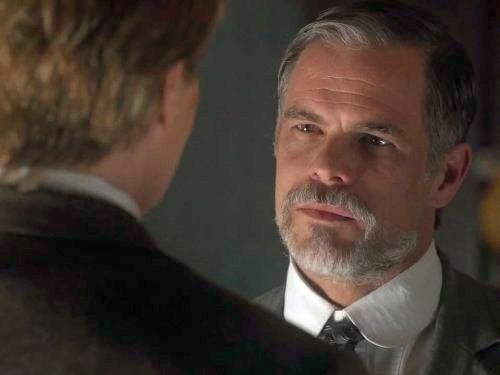 Abigail has found some evidence pointing to Gowen’s culpability in this matter, while Gowen and his lawyer insist that the guilty party is Abigail’s deceased husband. In addition to the ongoing Abigail-Gowen narrative thread, there is of course the Elizabeth-Jack relationship thread, which is suggestive of Northern Exposure’s Fleischman-O’Connell relationship thread. This is a stumbling and fitful progression that much of the time appears to be going nowhere, apart from some unseen longing glances on the part of the two of them towards each other. One of the impediments is Jack’s natural reticence and straight-arrow sense of bearing a high moral character. Another problem, which impedes so many relationships, is that of pride and concern for one’s sense of dignity. And there is also the complication brought on by the unexpected appearance of Jack’s former fiancé, Rosemary LeVeaux (Pascale Hutton), a flamboyant actress who represents competition for Elizabeth’s interests in Jack. But at the close of Season 1, Elizabeth and Jack have finally shared a tender kiss, acknowledging their mutual affection for each other. 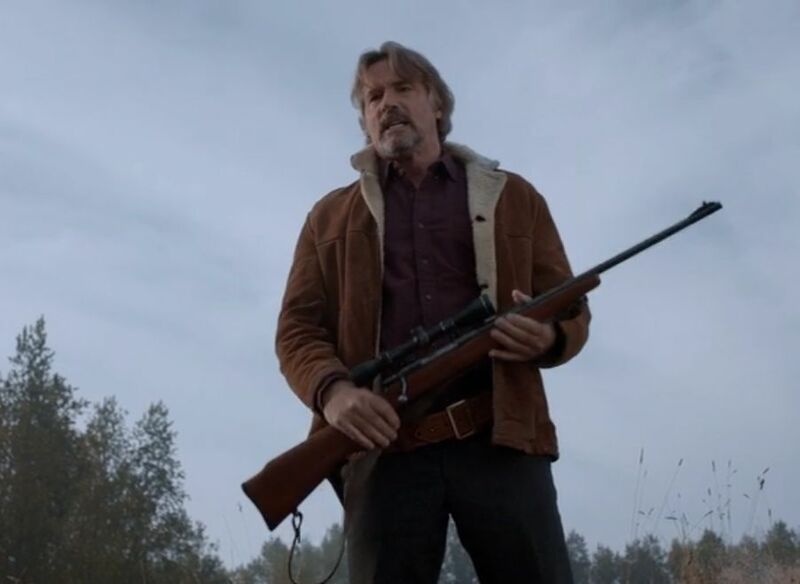 These developing narratives make the latter episodes of the twelve-episode Season 1 more connected and compelling, and they gradually lift the series above its early randomly episodic character. In the second season of the series, there are two recently introduced male characters that come into prominence. 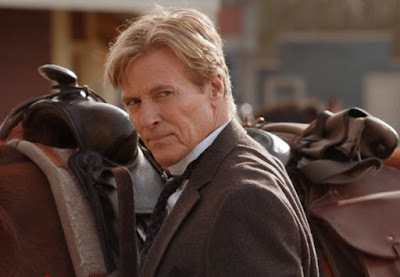 One is Bill Avery (Jack Wagner), a Mountie investigator who has come to the town to investigate the mining disaster. Avery appears to be benevolent but also apparently has hidden motives that make him a questionable figure. 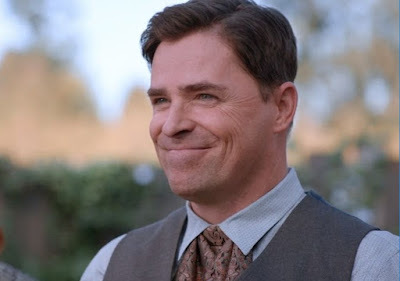 The other key new character is Leland Coulter (Kavan Smith), a wealthy visitor who decides to open up a sawmill in the town after the mine has been closed down. Both of these men are relatively laid-back, but they have key influences on the way the plot turns. There are also two relatively new female characters who receive more narrative focalization. One is Jack’s former fiancé, Rosemary (Rosie) LeVeaux, who moves to Coal Valley in an effort to win back Jack’s previously spurned affections. Another is Elizabeth’s flighty younger sister, Julie (Charlotte Hegele), whose romantic fantasies overwhelm her. Both of these characters are exaggerated stereotypes who are so over-the-top that they are likely to put off the viewer’s involvement in their stories. In particular, Rosemary’s incessant ear-to-ear toothy grins and smirks become a distraction. Although human relationships are key to this series, this second season is driven by four external dramatic events. The Court Case. First comes the court case concerning the culpability behind the mining disaster. A rare woman attorney comes to Coal Valley to take up the state’s prosecution of the case (another instance of this series’ focus on women’s proactivity). Although it looks like phony evidence concocted by the evil Henry Gowen is going to swing the case in favor of the mining company, a last-minute witness testifies for the prosecution, and Gowen’s company loses the case. The widows of the 46 miners who died in the tragedy are awarded damages, and the mine is ordered shutdown. The Sawmill. With the coal mine shutdown, the prospects for Coal Valley’s continuance look dim. But newly arrived investor Lee Coulter decides to build a sawmill there, and the town is saved. To celebrate the town’s new future, it is renamed “Hope Valley”. Return to Hamilton. Elizabeth learns of her mother’s serious health condition back in Hamilton and is escorted by Jack to the city to be with her family. Seeing her back in her upperclass surroundings, Jack is disturbed by the recognition that he and Elizabeth have such different backgrounds. He is also unhappy to see Elizabeth aggressively courted by her old childhood friend, Charles Kensington III (Marcus Rosner). Kensington is a handsome and polished upperclass gentleman who is ardently in love with Elizabeth. The Counterfeit Money Case. The secretive Bill Avery has been investigating a crime involving counterfeit money, and the viewer is given various bits and pieces of this case along the way. At a critical point the finger of guilt winds up pointing directly at Bill. Of course these external events provide the dramatic context for the key romantic relationships involving the principal female characters that are the focus of this season. Elizabeth. Elizabeth’s budding relationship with Jack is threatened by her new involvement with Charles, and the introverted Jack withdraws from her emotionally. By the end of this second season, thoug, seems almost to have been resolved. Abigail. The widowed Abigail starts responding to Bill’s tentative expressions of interest, and it looks like they are falling in love. This is ruined when Bill’s estranged wife Nora shows up on the scene. Later Abigail starts becoming interested in the town’s new church pastor, Frank Hogan (Mark Humphrey). But this relationship is clouded when she learns about Frank’s criminal past. Rosie. Rosemary LeVeaux is politely courted by Lee Coulter. However, her insatiable ego presents a continuing problem for this relationship to move forward. Julie. Julie Thatcher’s mad infatuation with Jack’s younger brother, Tom Thornton, seems headed for their elopement. But the upper-crust Thatcher family is adamantly opposed to such a union. Throughout all these affairs, Abigail remains the series’s beacon of Christian generosity and compassion. The combination of these context-providing events and romantic relationships are enough to make this a successful season for When Calls the Heart. Even the annoyingly artificial presentations of the Rosie and Julie characters are not enough to spoil one’s overall enjoyment. In the third season there is a new narrative structure introduced in which each episode is wrapped inside an outer contextual narrative showing Elizabeth writing about her experiences. This doesn’t really change things much, and we can assume all earlier episodes were stories “written” (inside this narrative) by Elizabeth. Again romantic human relationships continue to be paramount, but now there is a heightened focus on Rosie LeVeaux. This is unfortunate, because her unending and outlandish thousand-volt schemes to put herself in the spotlight become wearisome. Her presence in this series may have been an attempt to recreate something like Lucille Ball’s eponymous wacky character in the TV comedy series “I Love Lucy” (1951-57). But it doesn’t work. There are four external narrative threads, providing some context for the human relationships, that would seem to be narrative drivers for this season. But they often refer to events that take place off-camera, and they tend to terminate abruptly. Bill Avery’s counterfeit money investigation, clues for which had occasionally appeared in previous seasons, ends abruptly when Bill quickly captures the villain. There is little background given concerning motivation and context for this thread. Frank Hogan’s criminal past, for which we had served a three-year prison sentence, comes back to haunt him when the Garrison gang shows up in Hope Valley. Again, this thread ends too abruptly when the gang is violently thwarted by Jack and captured. An associated credulity-stretching sequence with this subplot concerns the Hope Valley residents’ discovery of Frank’s criminal past. Initially the townspeople express their wish for a new church pastor to replace the former felon. But when Abigail makes a simple appeal to all of them for Christian forgiveness, they, incredibly and unanimously, do forgive Frank and retain him as their pastor. The town’s sawmill, on which Hope Valley’s survival depends, is hit with sabotage events that cause the mill to be shutdown. The now-mayor, Henry Gowen, is the natural suspect, of course, since he seems to be behind all perfidy in the town, but the real culprit turns out to have been Lee Coulter’s assistant. There is another mining disaster near the end of this season. The nearby Silverton mine suffers a mudslide and cave-in that results in two deaths and about twenty serious injuries. Most of these minors are dirt-poor and have been living in a tent village near Hope Valley. In response to this disaster, the Hope Valley residents, led by Abigail, Elizabeth, Jack, and Frank, all rush to help these victims thanks to their faith-based sense of charity. Jack and Elizabeth continue their snail’s-pace courtship. They are now both dreaming of a future life together. Lee and Rosie come together. At the end of this season, they get married. Abigail and Frank are now an openly revealed couple. Surprisingly, Henry Gowen and Bill’s former wife, Nora, come together romantically. We learn that the two of them were involved with each other years ago, before Nora married Bill. At the end of this season, though, they head out of town in a car and get in a serious auto accident, which injures and incapacitates Gowen. Overall, this season does not measure up to its predecessor. It mostly consists of disconnected episodes that do not sustain a narrative continuity. And much of the time we are subjected to trite moralizing that is often presented in lesson form to Elizabeth’s school students, such as that one should always face up to one’s fears. Moreover, the acting, outside of Elizabeth, Abigail, Jack, and Frank, is frequently unconvincing. Cody, who is an orphan boy who had earlier shown up with his older sister in Hope Valley. He now comes into more prominence when he starts living with Abigail, who acts toward him as his adoptive mother. He also becomes a key figure in Elizabeth’s classroom. Sam Bailey is an itinerant peddler who shows in Hope Valley during Christmastime. During his brief visit in the community, his benign manner and magical, fairy-like influence helps convey the Christmas spirit to the community. Carson Shepherd is a mysterious newcomer to the town. He soon starts working in Abigail’s café. It is eventually revealed that he is a former doctor who is running away from his past. His dear wife had died after an operation he had performed on her, and he blamed himself for her death, even though the Cape Fullerton medical board exonerated him. His vengeful sister-in-law also blames him for her sister’s death and tracks Carson to Hope Valley in order to ruin him. A manager from the railroad, Ray Wyatt, comes and announces his proposal to route the new transcontinental railway line through the town. This will likely provide a big benefit for Hope Valley, but there are issues concerning the railroad’s insistence on routing the line over property owned by a poor farmer. As the new acting town mayor in place of Henry Gowen, Abigail must decide what to do that is best for all in this matter. The outlaw Tate gang attempts to rob a payroll shipment coming by stagecoach to Hope Valley. But Pastor Frank Hogan’s heroic intervention foils their plans. Later Bill and Jack capture the Tate brothers. Like earlier subplots in this series, this one terminates too abruptly for the purposes of supporting a continuous narrative. Bill tracks down a mysterious witness, A. J. Foster, who has evidence concerning Henry Gowen’s culpability in past misuse of public funds. At this point Ray Wyatt, who had earlier appeared to be a relatively benign, if perhaps too profit-focused, character, suddenly turns into an evil monster. He is also involved in Gowen’s illegal activities, and he is captured by Bill just as he is about to kill A. J. Foster. This all-too-brief subplot is adventuresome, but relatively lighthearted (featuring wise-cracking exchanges on the fly between Foster and Bill), and it is one of the better elements of this season. Cody becomes seriously ill with severe abdominal pains. A dispute arises when Carson insists that an appendectomy be immediately performed, while recently arrived Dr. Strohm equally adamantly says they should wait and see. Abigail is forced to make a decision, and she opts for Carson’s plan. In terms of romantic relationships during this season, there is, of course, considerable attention given. Rosie and Lee. Even though she is finally settled down in marriage, Rosie continues her outlandish attention-demanding shenanigans. But now Lee becomes a little more assertive and tones her down a bit. Abigail and Frank. They quarrel, nonsensically in my opinion, over Frank’s dangerous participation in the capture of the Tate gang. But of course they eventually make up. Elizabeth and Jack. Their relationship is stronger than ever. But when Jack learns of his former Mountie colleague’s death in the Northern Territories, he feels guilt about not living up to his lifelong vow of duty, and he volunteers to go off to the Northern Territories to lead a platoon of men. Before leaving, he proposes marriage on bended knee to Elizabeth, and she rapturously accepts. Overall, this fourth season of When Calls the Heart is a good one. The acting is generally better this time, and the subplots, though contrived and again abruptly terminated, work better to move the action. Also, Elizabeth’s classroom interactions with her students, an important element in this series, are organic and more effective. “Inspirational Fiction”, Wikipedia, (17 September 2017).